The Student Leadership Team is a council of undergraduate and graduate students at Princeton University, Westminster Choir College, and Princeton Theological Seminary tasked with providing lay leadership for the vision, mission, and ministry of The Episcopal Church at Princeton. In addition to gaining practical leadership skills directly transferable to the parishes students will join upon graduation, the Student Vestry infuses a collaborative approach to every aspect of ministry at ECP––with lay student leaders working together with their chaplain to discern what God is calling us to on campus and articulate a hopeful vision for our share in the Jesus Movement. 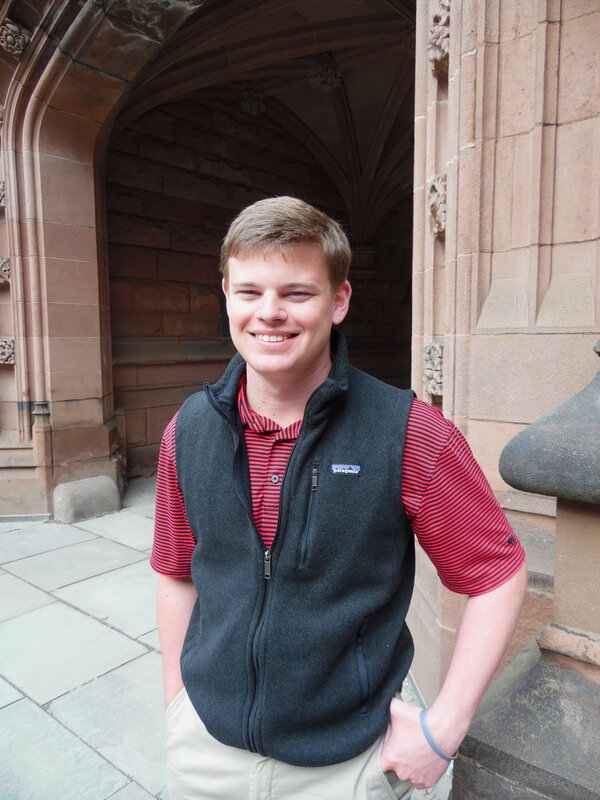 Will is a junior at Princeton University studying history. A native of Rome, Georgia, he is involved in political organizations on campus, works watching the University Chapel, and is a member of Cottage. In his spare time, he enjoys watching college football (GO DAWGS) and listening to the Marshall Tucker Band. Contact him at wwc [at] princeton.edu. Marina is a sophomore at Princeton University pursuing an AB degree, currently undecided about what she'll be concentrating in. Originally from McLean, Virginia, Marina is a part of the club field hockey team and the Big Sibs club. In her free time she works as a tutor and enjoys reading, listening and dancing to music, and working out. Marina can be reached at marinarc [at] princeton.edu. Naomi is a current student in the Master of Divinity program at Princeton Theological Seminary, with (only!) one year of her program remaining. She recently moved from Colorado where she graduated with a BA in Theology and Biblical Studies, and hopes to continue her formal education by studying ethics after receiving the MDiv. In her studies, she is interested in how stories (particularly scriptural narratives) mold Christian life today. When Naomi is not hidden away in the seminary’s library, she enjoys biking, reading novels, exploring new places, and hanging up her hammock wherever she can find room. Contact Naomi at naomi.ketchens [at] ptsem.edu. Eric is an senior at Princeton Theological Seminary pursuing a Master of Divinity degree. Originally from Colorado, he grew up in the evangelical church and has only come into the Episcopal Church within the last three years or so, having been part of parishes ranging from the “high” Anglo-Catholic end all the way to the charismatic Anglican tradition. Eric completed a B.A. in Classical History at Colorado Christian University before moving to Princeton. In his free time, he enjoys reading classical literature (especially Russian novels).